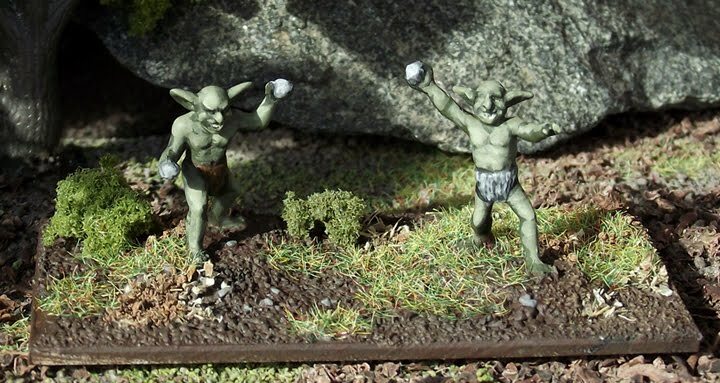 I finished painting three elements from my 1/72 goblin army. 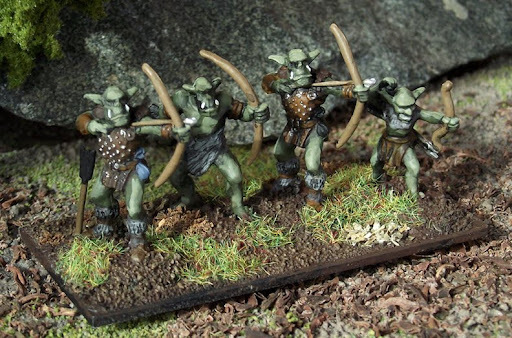 I'm following the fan-made LOTR DBA army lists from David Kuijt's site. For models I'm mixing manufacturers. 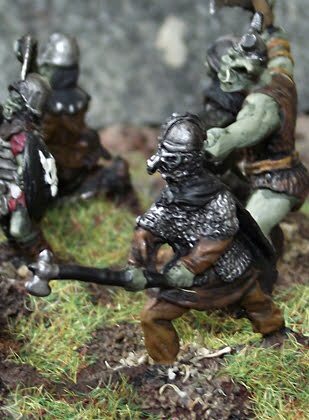 In the warband element (thumbnail at left and the photo bellow) I am using Rebel Minis Bag o' Orcs (now sold as Armored Ogres by Splintered Light), Caesar orcs and some gnarly-looking Strelets Franks. 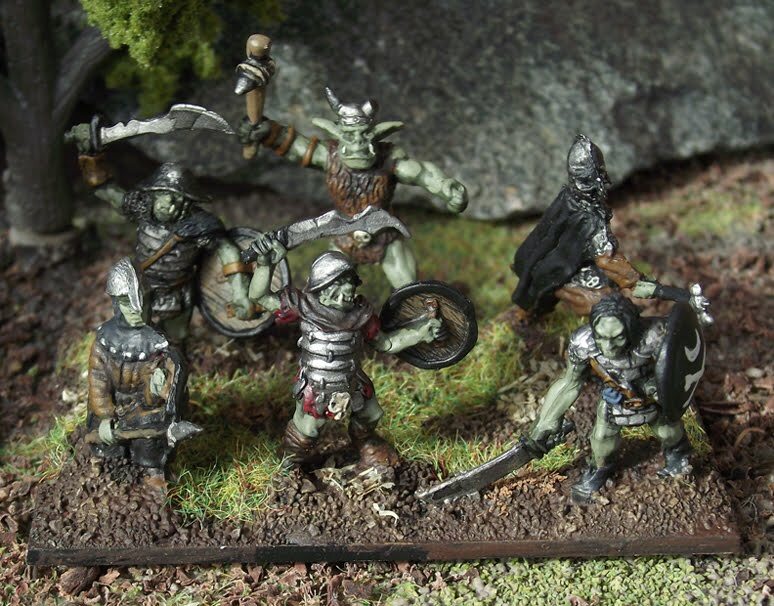 My old 28mm orcs were painted with grey skin, so I thought I'd have a little fun with these green guys. I used Citadel's old "Catachan Green" paint as a base, and I mixed "Rotting Flesh" for the highlights. The archers above are all Caesar orcs and a goblin. The above Ps element shows psiloi in the truest sense. 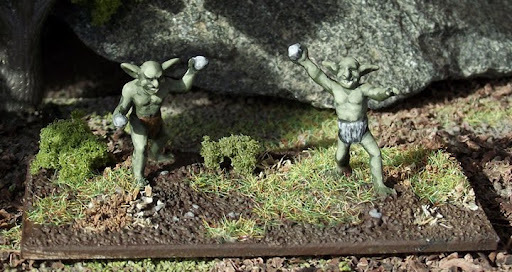 These rock-throwing 1/72 goblins come from Caesar. The fellow on the right was initially holding an 17th century-looking grenade, but I clipped off the fuse to convert it into a rock. And I've got the command element models all picked out in this previous post. I like them! Good work with the skirmishing goblins. Is this for DBA or HOTT? I'm not a Goblin enthusiast, but I must say you've made a great job of these. I recently got the HOTT rules, but I'm doing DBA. I'm still getting the hang of DBA rules, so I wanted to stick with them. If I moved on to HOTT I'm sure a lot of the elements would work in that too. Tell you what, the people at rebel minis sholud use your painted version as the advert. They look great....makes me want to get an orc army going. Thanks Paul. I made one base with only Rebel Minis models, so you can see all the poses together. I'll post that later. Loving those Rebel mini Orcs - shame they're not a little bigger or I'd go for some of them for my 28mm project. Rock throwers are pretty nifty too! Wow very well painted. I hope you post some pictures of those guys in action. They look brilliant Andrew! Well done indeed, great work. Really good! You can't really tell that they come from so many sources. Those are really good, they all go together really well. I like the use of the Strelets figures too. I got some of Splintered Lights goblins to mix in (the wolf riders). They're 15mm, but their chunky style makes them fit in with the taller 1/72 plastic.